experiences.CharmingPuglia.com suggests you to rent a car to reach your desired hotel. 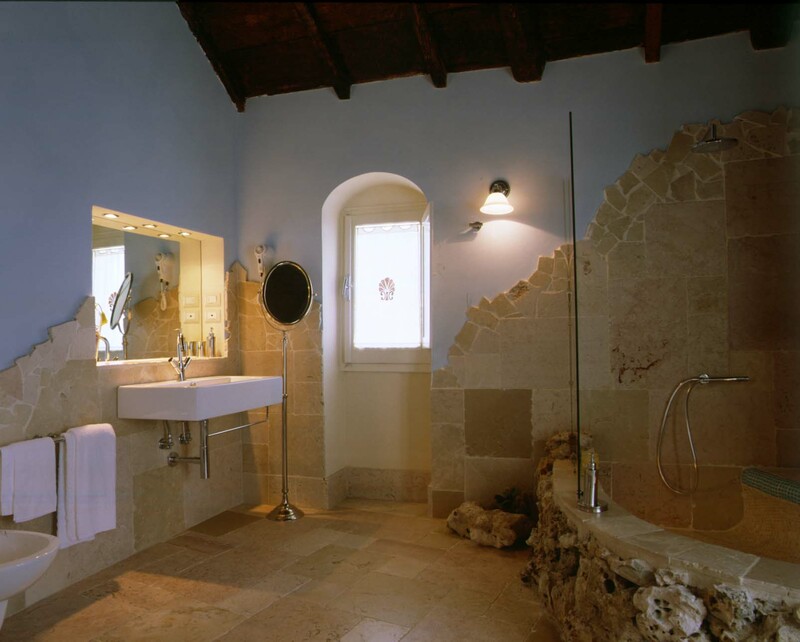 Located in the center of Sasso Caveoso, in the beautiful town of Matera, La Casa di Lucio is only a few meters from its historic center. The nearest airport is Bari Palese, which is about 60 km far from the hotel. Born from the renovation of an ancient house of the 16th century, La Casa di Lucio immediately transmits the feeling of being in another dimension, such is the fascination that the ancient walls can inspire. This charming historic house is decorated with light colors, with a mix of modernity and tradition that makes it truly unique. The Restaurant "Regia Corte", entirely carved into the tufa, is about 100 meters from the hotel. Here, guests can taste the typical dishes of the Mediterranean tradition. The restaurant has a panoramic terrace, the Lounge Terrace, which offers a stunning view of the Murgia Park. Breakfast at La Casa di Lucio is served in a large and very charming room in tufa, and is based on own production products such as jams, cakes, pies and various omelettes. Small courtyard with tables and sofas, where guests can have a coffee and read newspapers enjoying absolute peace of mind. Internet is free and available at the reception or via cable in the rooms. 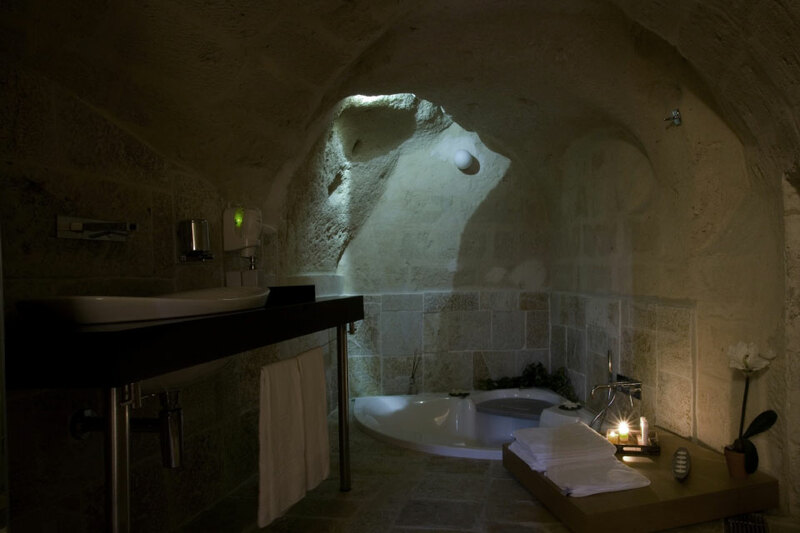 Deluxe rooms are carved into the rock. The decor is simple, the choice of light colors for the furnishings is due to the desire to allow light to better spread among the niches of these fascinating and unique cave dwellings. The rooms are characterized and enriched by a pleasant alternating between tradition and modernity. The bathrooms are equipped with showers. Junior Suite with double bed. 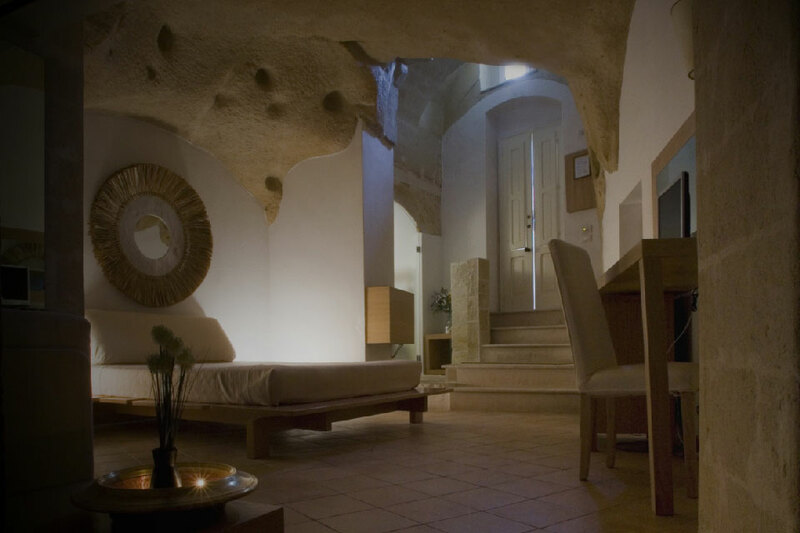 The furniture of the Junior Suites is simple, the choice of the light colors of the furnishings is due to the desire to allow light to better spread among the niches of these fascinating and unique cave dwellings. The rooms are characterized and enriched by a pleasant alternating between tradition and modernity. The bathrooms have showers with color therapy. Suite with double bed. Some are carved into the rock and have a bath with color therapy. Those which are not carved in stone, however, have a bath and a small balcony. 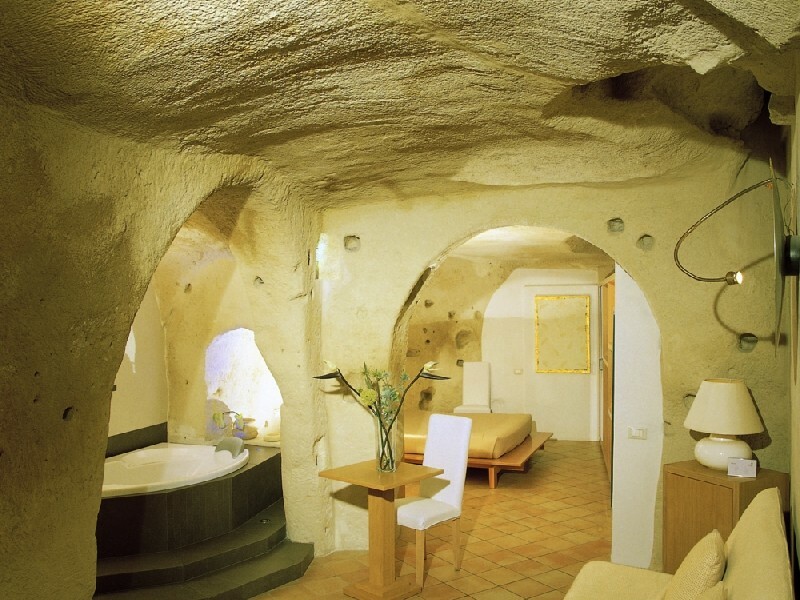 The decor of the Suites is simple, the choice of light colors for the furnishings is due to the desire to allow light to better spread among the niches of these fascinating and unique cave dwellings. The rooms are characterized and enriched by a pleasant alternating between tradition and modernity.